Katahdin, the terminus of the Appalachian Trail, in the background. Talk of mysteries! Think of our life in nature—daily to be shown matter, to come in contact with it—rocks, trees, wind on our cheeks! The solid earth! The actual world! The great slabs of granite loomed over us in the darkness. Caught against the backdrop of a starry night, we stared in fascination at the infamous “boulders.” We paused to catch our breath—not from exertion; we were too excited to be tired—but from the depth of beauty that surrounded us. At 3,500 feet, silhouetted against the predawn sky to our left, “the owl” rose from the Lakeland below us. Ahead of us, the giant rocks that led to “the gateway” and “the tableland,” appeared incandescent. We turned off our flashlights and allowed our eyes to adjust to the light. By the light of the moon and stars, we could see peaks, lowlands, lakes and the distant twinkling lights of Millinocket. We had been hiking for almost three miles and would have another 2.4 before we reached our goal—Baxter Peak. A week earlier and a half-day out of Monson, impending rain along with the malaise that always followed an eating binge in town, made it an easy decision to stop at Leeman Brook Lean-to. Peter (M&M) Scal, Frank (The Hawk) Logue, and I (The Dove) were among the group that filled up the new shelter. M&M and Hawk went to work building a roaring fire while the rest of us set out sleeping bags and gear. We were thankful for the shelter’s stout roof that night when a downpour loud enough to wake the gods jolted us out of our sleep. 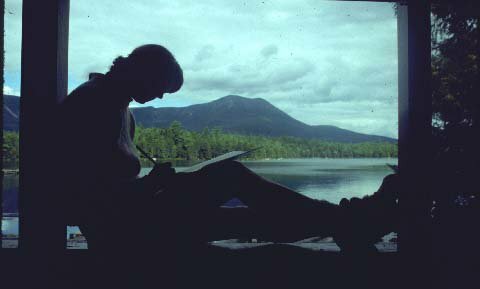 While sitting around the fire that night, reading, talking, and writing in our journals, an idea that had occurred much earlier in the trip was once again suggested: Let’s climb Katahdin at night so we can be on the summit at dawn. The idea originated in Pennsylvania just prior to the Cumberland Valley road walk. I remember that much, because, as we trudged down those roads from 6 p.m. until 2:30 a.m., I thought there was absolutely no way I would ever hike at night again. Never say never. I had also sworn that I would never hike more than 20 miles in the rain and managed to do that at least half a dozen times. So, despite the “Night Hike of the Living Dead” (a 30-plus-mile day for most of the eight of us involved in the adventure), the subject had been brought up innumerable times since. Our second day out of Monson, because of more torrential rain, was also spent at Leeman Brook Shelter. We spent the day reading register entries about how long it took to get through the 100-mile Wilderness to Katahdin. Of course, we reasoned, these were southbounders writing, hikers less than a month into their thru-hikes. We, on the other hand, were more than five months into ours. Sure it was the 100-mile Wilderness, but just as surely we felt we could make it to Abol Bridge in five tough days. Because M&M needed to resupply at the campground six miles off Cooper Brook Logging Road, he left about noon that day, but not before a number of us agreed to meet at Katahdin Stream Campground on the last day of August. Our first day out, we faced the results of the rain when we were forced to ford numerous flooded streams and rivers. The first stream was deep and Maytagged me half way across. I found a hiking stick and was more careful the rest of the day. Our second day out of Leeman Brook, a full shelter necessitated a night hike over Gulf Hagas to the Sidney Tappan campsite, and meant a couple of hours spent dodging moose as briars whipped our legs. Setting our tents up on the grassy patch illuminated by a full moon to a background symphony of howling coyotes, I decided I wasn’t so sure I wanted to climb Katahdin in the dark. The following day, we made it to Cooper Brook, where I feasted on pan-fried lobster mushrooms and grabbed my last chance for a bath and hair wash in the frigid stream. We made it to Abol Bridge on schedule and met up again with M&M. The next day, we celebrated our imminent finish with grilled hotdogs and beer at one of the tiny shelters at Katahdin Stream Campground. A park ranger stopped by to check on us. “When are you going up?” he asked. It was obvious, from both our demeanor and the stains of pack straps on our t-shirts, that we were thru-hikers. “Early,” we responded. We still weren’t sure how early we’d be able to get up. “Well, if no one is there, make sure you sign in,” he reminded us. At 2 a.m., the alarm on Hawk’s watch beeped us awake. We had drifted off to sleep after all, I thought, amazed. The excitement of the impending climb had kept us tossing and turning until well after midnight. The three of us shivered in the chilly night air of the first day in September. We quickly layered on the remainder of our clothes—long johns, shorts, shirts, sweaters, hats and gloves and several pairs of socks. We hurriedly prepared a breakfast of fruit pies and cocoa, and were soon ready to begin our ascent. We left our packs at the ranger station, signed in, and headed out. Beneath the cover of the trees, we had some difficulty seeing, but the narrow beams of our flashlights picked out the biggest rocks and roots. We reached the first exposed area, a patch of slab rock and blueberry bushes, and our heads simultaneously arched toward the sky. We gasped as a meteor burnt its trail above Katahdin; then smiled. It had to be a good omen. We continued to soar up Katahdin in the moonlight, the light from the crescent a beacon leading us to Baxter Peak. Our bodies were warmed by our exertion, and, though my gloves were soon wet from the dew-damp rocks, it didn’t matter. We passed by Thoreau Spring, marking the last mile to the summit, at 5:00 a.m.
We trotted, and sometimes jogged, that last mile. As we neared the final ridge to the top, we were forced to make a quick decision. A large cloud covered the summit of Baxter Peak. Did we want to remain where we were, so that we could see the sun rise in the east, or did we finish in a cloud? “Go for it!” we yelled, simultaneously, deciding it was more important to finish the six-month journey. As the echo of our shout faded away, so did the cloud. It seemed to explode from the center and stream away in all directions. There it was! Silhouetted against the pale orange and yellow of the not-yet-risen sun was the sign that marked the northern terminus of the Appalachian Trail, a sign we had trekked more than 2,175 miles to reach. We approached it running, sobs of joy caught in our throats, tears brimming, stinging our eyes, and shouts of exultation bursting from deep within us. “One, two, three!” And we slapped our palms against the sign, failing to hold back the tears in our eyes. I’d never been so happy. We placed the small stones we had carried with us all the way from Springer Mountain on top of the cairn that marked the end of the trail. A bottle of Dom Perignon was opened, toasts and pictures made. The sun was finally rising, and it was breathtaking. We watched, convinced we were the first people in America to see the light of the new day painting the black palette midnight blue, orange, yellow, red, and pink. It was only our freezing bodies that forced us back down. But, as elated as we were, the trip down was as easy as the trip up.